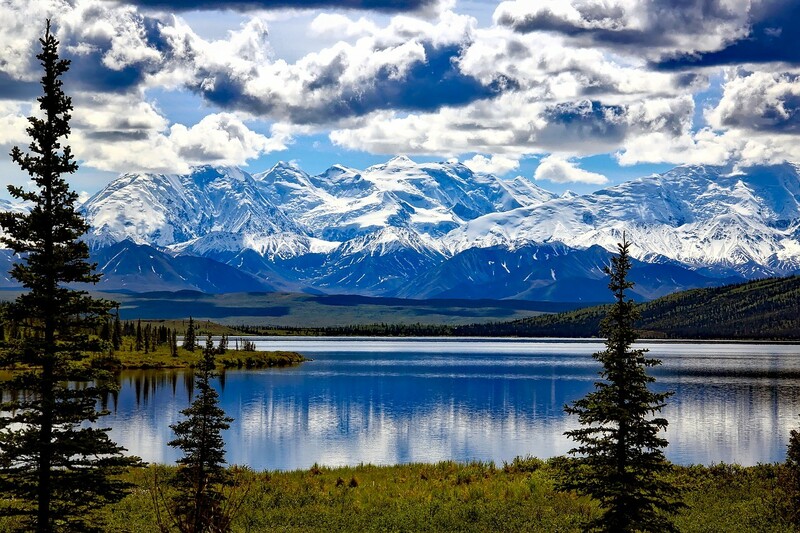 It's no wonder that Alaska is on everyone's bucket list. It's the largest state in the Union, purchased in the 1860's for $7.2 million, and about 62% of Alaska is administered directly by the federal government; less than 1% of the land is privately owned. The glaciers, wildlife, wilderness, national parks and much more attract almost two million visitors each year, and of course one of the main attractions is the tallest mountain in North America, Denali, formerly known as Mt. McKinley, rising 20,320 feet above the earth. Of course, May through September is the busiest times of the year for tourists. They enjoy 18+ hours of daylight and moderate temperatures at that time. The rainy season begins in late August and as the days get shorter the weather gets more unpredictable. Along the Inside Passage, especially in Fairbanks, they enjoy some kind of moisture on average of 340 days a year. Get this....dog mushing is the state sport, and would you believe that gold panning is still a serious activity for some folks. One interesting fact about Alaska is the location of their state capital, Juneau. It is the only state capital that is inaccessible by automobile. To get there you have to fly in or boat in!! It also is the only capital with a glacier within the city limits. Juneau is one of the three ports cruisers enjoy when they cruise the Inside Passage; the others being Fairbanks and Skagway. At each port, the cruise line will promote excursions that will introduce you to some of the dramatic sights and wildlife that exist in their native environment. Activities like glacier hiking, dog sledding, river rafting, salmon or halibut fishing will require a little more money and some expert guides. How about eating a “Reindeer Dog”, a hotdog made with reindeer meat; or Eskimo Ice Cream that is made by whipping together seal oil, reindeer fat, snow and wild Alaskan berries. We initially introduced our Travel Factory Gang trips to only the Inside Passage, flying to Seattle, making the three ports and cruising Glacier Bay, then returning to Seattle. That was a 7-day trip and the least expensive(about $7,000 a couple including air from DFW), way to “check it out”. But you miss out on some spectacular sights and wildlife opportunities by not visiting the Interior of Alaska. So, for the past 20 years we have included a portion of the interior of Alaska by flying to Fairbanks and seeing the sights around that city, busing down to Denali and exploring the vast Denali National Park, busing further the next day about 100 miles south to a lodge about 35 miles from The Mountain, then riding the train from an interesting Alaskan city named Talkeetna to Anchorage where we spend the night in the largest city in Alaska (population around 300,000), and then get on the ship at Whitter after visiting the Alaska Wildlife Preservation Center. What an Interior visit!!! This year our Travel Factory Gang trip leaves on July 8, returns on July 20. So far there is space available, but the closer we get to the end of the year, it disappears quickly. Also, airfare continues to escalate, so making the plans early is imperative. Give a call to The Travel Factory at 698-1421 or toll-free 800-760-4040. Better still, stop in for a visit and get a brochure of the experience at 4150 Southwest Drive at the Plaza at Park Central between Rosa's and Chick-Fil-A. Enjoy being a part of our 25th group to the “Last Frontier”!!!!! Alaska. . . Still The Last Frontier!!! !